Getting a divorce or dealing with child custody can be one of the most trying experiences in life. Dealing with emotional distress is bad enough, but adding legal proceedings can push some to the breaking point. 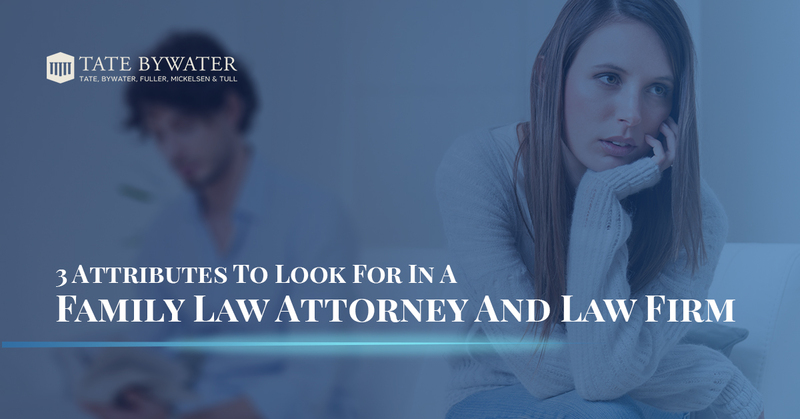 That’s why it’s important to find the right family law attorney to represent you during this difficult time, one who has the level-headedness and compassion to help you get the most favorable outcome. Here are a few pieces of advice when hiring your lawyer. Feel comfortable with your family law attorney: You’ll be spending a fair amount of time with your attorney, so you want to make sure it’s someone who you’ll get along with. And while you might not become Facebook friends, you want to find someone who will give you their time and not be distracted while you’re in the office. At TATE BYWATER, we’ll give you the time you need to give you the best chance for a favorable outcome. Feel comfortable in the surroundings: There can be a lot of hustle and bustle in a law office, but it should never get in the way of delivering you top-quality service. Just know that many of people moving about will be working for you on the back-end of your case, even when you don’t realize it. Know their tenacity: At our law firm, we’re not going to roll over. We’re going to do whatever we can within our considerable abilities to find you the best possible outcome for your family law situation. If that includes going to court, we’re ready to defend your rights. It’s important that you feel comfortable around your family law attorney, so we invite you to visit us in our Vienna, VA office. At TATE BYWATER, we will fight for your rights.